Before doing anything please read our health and safety notes! To prevent splintering Carbon Fibre is best machined or cut with high speed, & low feed or pressure. Be careful handling cut edges. 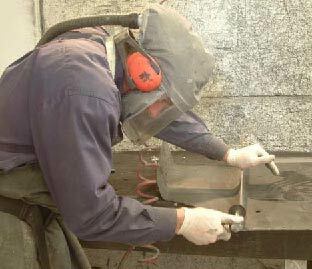 Use a 120 grit abrasive to de-burr holes and edges before handling. Thin laminates (under 0.5mm thick) may be cut with very sharp scissors, shears or by the methods listed for thicker laminates. Handsaw or air hacksaw with a minimum of 22tpi. Band saw or jig saw ideally with diamond-coated blade or a minimum of 22tpi. A cheaper less-durable alternative is fibreglass reinforced cut-off wheels (Part No’s: 426 or 456) with matching mandrels. These are stocked by most DIY stores. 115mm x 1.0mm x 23mm hole reinforced carbide or diamond coated cut off wheel in 115mm electric or air grinder. When using cut-off wheels ensure gloves, eye protection and mask are worn at all times. This is due to the wheels breaking up and splintering during cutting - Ceramic diamond-tile circular cutter table, for use with flat sheet. Use sandpaper or fine grit tungsten block for edge finishing. When machining use a high cutter speed, with low feed and small tool path steps, specialist cutters are available for CNC machining of composites. Tungsten carbide with special helix and spiral composite developed profiles are designed to reduce edge chipping and delamination also PCD, PVD coated. There are many specialist tooling suppliers that will even offer help on making bespoke specialist cutters to suit cutting particular laminates for particular jobs considering tool wear and delamination, edge chipping e.t.c. For drilling thinner laminates use a standard 118° point HSS jobber drill bit. Start by drilling a 3mm pilot hole (or smaller) and enlarge carefully in small steps, occasionally reversing the drill. Once complete de-burr the hole with 120 grit sandpaper or an abrasive cone point (available from J&L). For very thick laminates use a diamond-coated or solid carbide drill bit. 3-flute solid carbide end-mills are also effective. Wet-sand the surface to an even matt finish using 600, 800 and 1000 grit wet & dry paper. Then polish with Farecla G6, then G3 polishing compound or 3M fast cut liquid, using a 3” foam (or 3” lambswool for faster results) mop head (right-angle air grinder mounted), or a 9” polishing mop for larger areas or 3” lambswool for faster results. Spray a fine mist of water over the part when applying to polish to make polishing smoother. Push hard while polishing, making the surface quite hot. Any porous areas may be improved by the application of black wax or shoe polish. Regularly apply 606 or Armor-all protectant for protection from UV rays. When polishing lacquered or clear coated parts we recommend Using 3M Trizact discs P1500 and then P3000 to remove scratches and any pig tails from dual-action orbital sanding. Then, polish with lighter pressure, slower speeds and lower heat using 3M Fast Cut liquid, with 3M green foam or lambswool mop. Later, you can apply some water spray mist. You can finish with a foam mop head and a finer polish to remove holograming and add a protective wax coat, black wax or black shoe/boot polish is good as it will hide any small pin holes from any white polish dust.